Are you having a hard time wondering what the best toys and gifts are for 18 month old boys and girls? If so, you’ll be pleased to hear that you’re in the right place. Finding toys for 18 month old toddlers can be tricky because there are so many different options available. Do you get something that’s more geared towards learning or fun? Or maybe both? You can be sure to find what you’re looking for in the list of options that are in our review. A buyers guide section is also available that provides you with even more information. 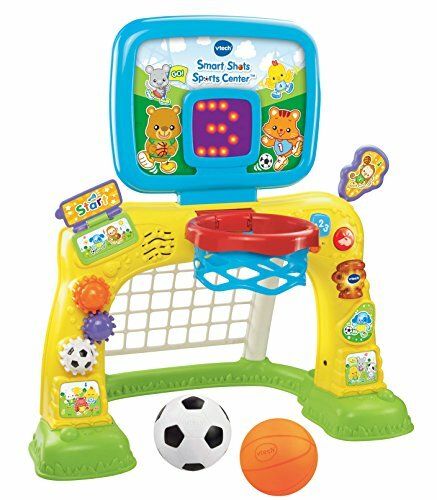 VTech’s Sports Center smart shots comes with a 2-in-1 design feature that kids have been loving. It can function as a basketball hoop or a soccer net, which provides your little one with different playing options to keep themselves entertained. While using the basketball to throw and soccer ball to kick, children are able to develop their motor skills and hand-eye coordination. Not to mention, it’s a fun way to encourage them to play more actively and exercise. We liked how there are over 50 songs, phrases, and sounds available too. This makes the set more interactive for children and improves their auditory learning senses. Children can also press the the different buttons to activate the sounds. This is a great toy set for young girls and little boys that allows them to have fun shooting basketballs and kicking soccer balls to improve their motor skills and coordination. The Mega Bloks Big Building Bag set is another great option that both young boys and girls can have a blast with. It comes with 80 block pieces which keeps children entertained for a while. 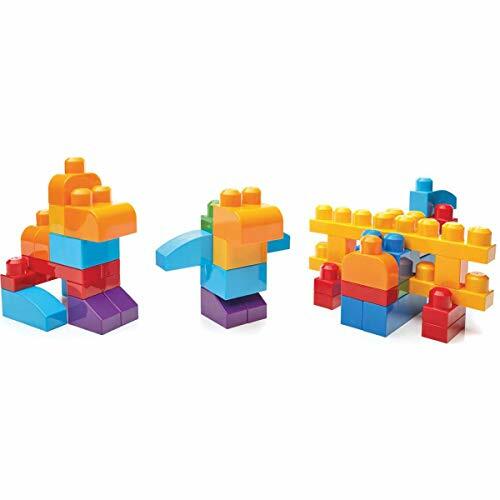 We liked how these blocks are available in different shapes and colors. You can expect your little one’s color and shape recognition abilities to improve greatly. It’s also an excellent hands-on playing experience. Therefore, children are provided with a great opportunity to develop their hand-eye coordination and motor skills. They can also let their creative side run wild by coming up with different structures. Kids have been having fun with how they can build different structures and be creative with this set. Their motor skills and coordination are able to improve greatly too. With a wooden toy car, hammer, and balls available, your kids have plenty of items to play with and keep themselves entertained for hours. The toys available in this set involve a hands-on playing experience. As a result, children are able to develop their motor skills and hand-eye coordination, as well as their tactile abilities. Kids can use this set to pound the balls with the hammer or turn it into a track. This can be easily achieved and lets your kids roll the car along the track which they have a lot of fun with. There are also a ton of different colors that have been used to design this set. Kids find this more exciting and are able to improve their color recognition skills. Children have been loving how they can either hit the balls with the hammer or use the set as a track to watch how the toy car can whiz down it. 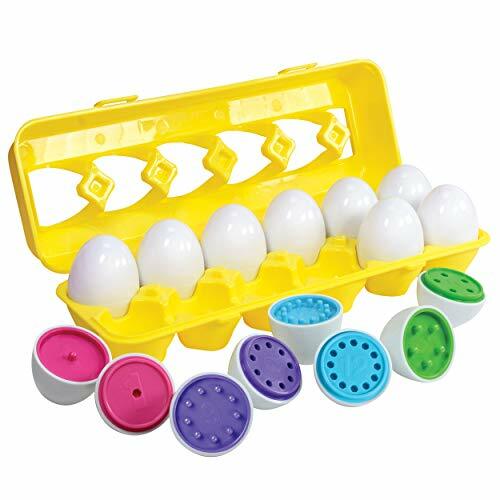 This set by Kidzlane features 12 eggs that are available in different colors and come with different numbers on them. Therefore, it’s awesome for improving your little one’s color recognition and basic number skills. It’s also appropriate as an Easter gift since it’s egg themed. We also liked how these eggs encourage kids to pick them up and sort them. It’s a great way to improve their sorting abilities. In addition to this, their motor skills and hand-eye coordination are able to develop. We liked how they’ve designed these eggs with a smooth exterior as it’s safe for kids to hold onto. Moreover, the material and shape means that they’re perfect for your children’s small hands. Boys and girls are able to easily hold onto these eggs due to the size and materials used. They can also improve their color recognition and basic number skills. 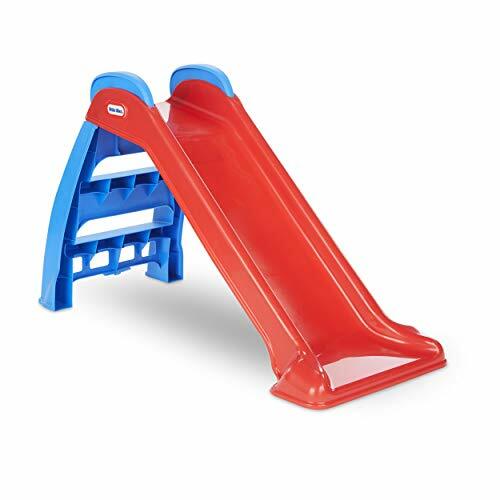 If you’ve been looking for a beginner slide for your kids, this Little Tikes option would be a fantastic choice. It has been made specifically for younger children, which is why it’s just 3 feet in length. We also liked how it can be folded down effortlessly. This makes it super easy for you to keep it in storage until your children want to play with it. There are handrails that can be clicked into place that make the slide secure. It’s also an excellent choice for kids as it enables them to play both indoors and outdoors. So, if the weather isn’t so great, the smaller size means that you could still set it up indoors. This is an awesome first slide for boys and girls that lets them get used to playing with a smaller slide before they feel comfortable moving onto larger ones. This is a great RC Race Car that introduces kids to remote control toys. It comes with music and headlights that flash. These sound and light effects make the toy even more exciting for boys and girls to play with. It’s also great for improving your little one’s visual and auditory learning senses. Not to mention, using the 2-channel remote is incredibly easy for kids to get the hang of. They can use it to move the car backwards and forwards. Using this remote is a superb way to develop your child’s motor skills and hand-eye coordination. Parents have also been pleased to discover that all of the materials that have been used to construct this toy are free from toxins. The easy-to-use remote means that boys and girls can be introduced to RC toys in a way that isn’t overwhelming. Instead, they can focus on learning the controls and having fun! 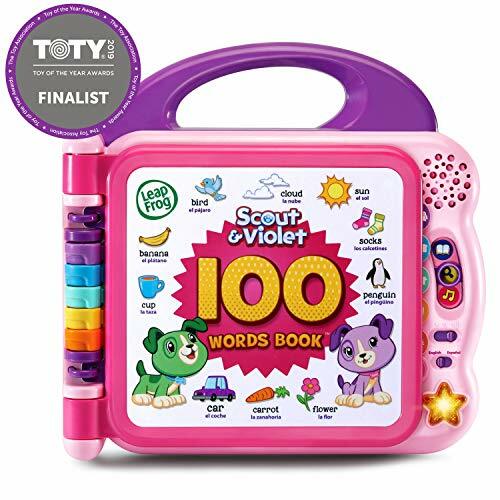 The LeapFrog Scout and Violet Book is among the top gifts for 18 month old girls because it has been designed with pink and purple colors. This entices girls to feel more excited to use it. We liked how it comes with a wide range of word categories. These include colors, animals, vehicles, clothes, food, and more. Among all of these categories, there are over 100 words available for kids to learn about. So, this is a highly educational option. However, they’ve made sure to also make it interactive and fun. Kids can touch the words and listen to how they’re pronounced. In addition to this, sound effects and songs are available too. This makes the words more exciting for your little girl to learn. Since girls are able to touch the words and listen to how they’re pronounced, along with songs and sound effects, they’re provided with a more interactive learning experience. If your little girl or boy is a fan of Sesame Street, they’ll have an absolute blast playing with this Cookie Monster Toy. It has been made with incredibly soft plush materials that make it comfortable to cuddle with and hold. We were impressed with how it can speak a phrase and sing. This is super fun for kids to listen to and can develop their auditory learning senses. A pretend chocolate chip cookie has also been attached to the toy’s hand. Since it’s 13″ in size, kids love cuddling with the toy and taking it with them to bed. They can also use it in their pretend play games to play with a lot of imagination. As a result, their creative thinking skills can flourish. 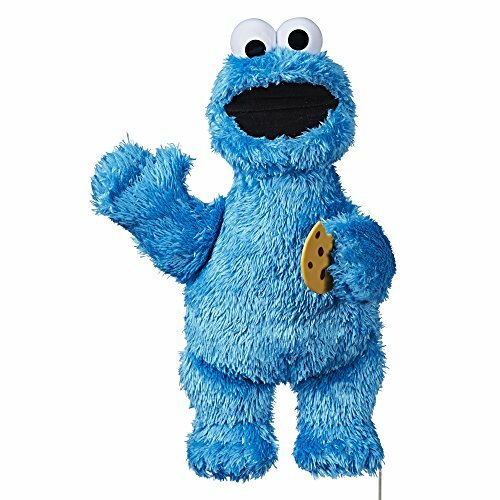 Children who love the Sesame Street show have a lot of fun cuddling and playing creatively with this Cookie Monster plush toy. 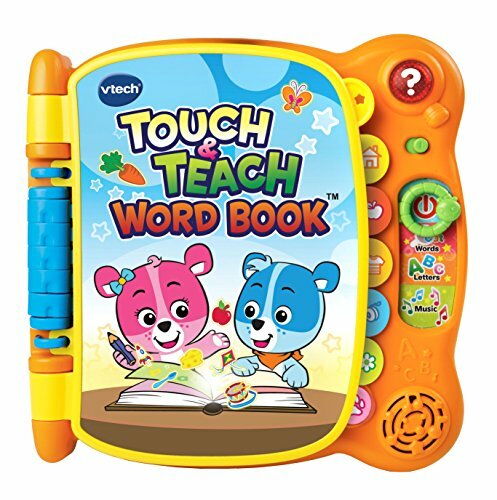 VTech’s Touch Book is a fantastic gift for boys and girls and comes with more than 100 words for kids to learn. These words cover a range of 6 categories and are spread out over 12 pages. We liked how these pages have a touch sensitive feature. Kids can touch the various words to active music and sound effects. This is an awesome feature that makes the learning experience more exciting. 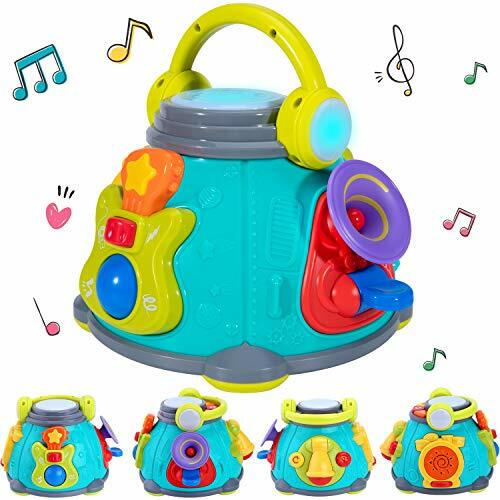 It’s also fantastic for your little one’s auditory learning senses. In addition to this, they’ve used a range of bright colors to design all of the pages. As a result, the learning experience feels more fun and your child’s color recognition skills can develop. Children have a lot of fun using the touch sensitive and sound features as it makes learning the various words a lot more fun. The Little Tikes Giraffe Toddler ride on is an incredibly exciting toy that girls and boys have been loving. We liked the giraffe design as it familiarizes kids with animals and makes it more exciting to play with. It has a seat that can be easily adjusted to ensure that your little one can ride it with comfort. There’s a back wheel that has been purposefully made to be larger as it provides kids with more stability. As a result, it’s an awesome choice for beginners. It can also be used both indoors and outdoors. While kids are riding it, their hand-eye coordination and ability to balance are able to develop well. 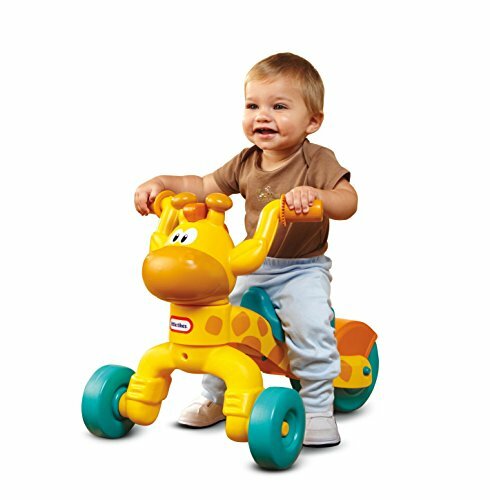 If you’ve been looking for a beginner ride on toy, this Giraffe one by Little Tikes is great due to the larger back wheel and adjustable seat. Boys and girls have been having a blast with how they can be pushed along on this John Deere Toy. It enables you and your little one to spend some quality bonding time playing together. We liked how it has a realistic tractor design as well. This makes it feel more realistic for children to play with which can help them to implement it into their pretend play games. As a result, their creative thinking skills are able to thrive. 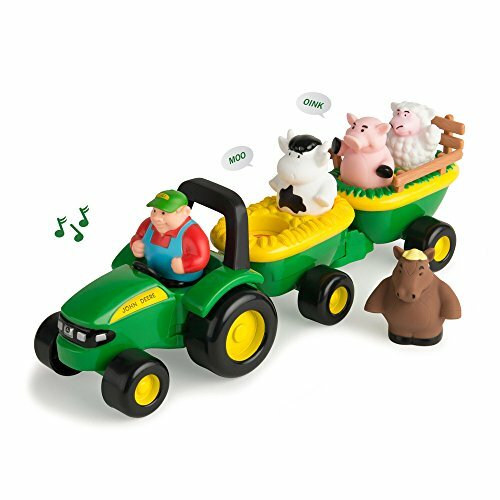 Furthermore, there are 4 farm animals toys available too. Children can use these to differentiate between various animals while playing with them. They can also press a button to listen to animal sounds, which is highly interactive and great for your child’s auditory learning skills. We liked how this John Deere toy has been made to look like a real tractor as it makes the playing experience more realistic. Kids are also able to learn about different animals while playing with them. Boys have been having a lot of fun with this vehicle toy set as it comes with a bulldozer, tractor, cement mixer, and dumper toys. We liked how they’re available in different and bright colors as well. This makes them more exciting for boys to play with and improves their color recognition abilities. Not to mention, these toys involve a hands-on approach to playing, which is awesome for your little one’s motor skills and hand-eye coordination. In addition to this, children love using these toys to play with a lot of imagination. Therefore, you can expect your child’s creative thinking skills to improve greatly. Parents have also been glad to find that the materials used are of a high-quality and free from toxins. 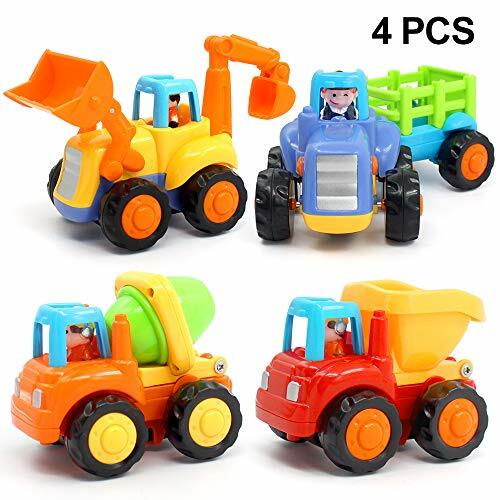 Boys have been having a blast with this toy set as it comes with a bulldozer, cement mixer, tractor, and dumper that enables them to play with a lot of creativity. 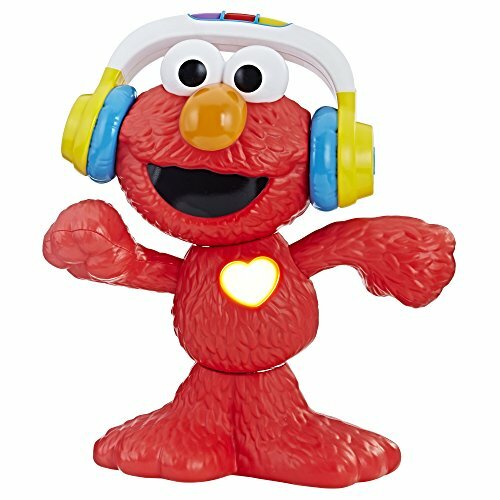 Boys and girls have been having a blast playing with this Elmo toy. If your little one loves Sesame Street, you can be sure that they’ll be able to use this toy in their pretend play games for hours of fun. As a result, it’s awesome for improving their creative thinking skills. We were also impressed with how it can sing and dance. These are interactive features that children have a lot of fun with. It can also speak a number of phrases that encourage kids to dance and sing with it. It’s also 12″ in size, which is great for little hands to hold onto and play with easily. This is a fun toy for kid who are fans of Sesame Street. They can keep themselves occupied for hours while singing along with this toy and playing with it creatively. 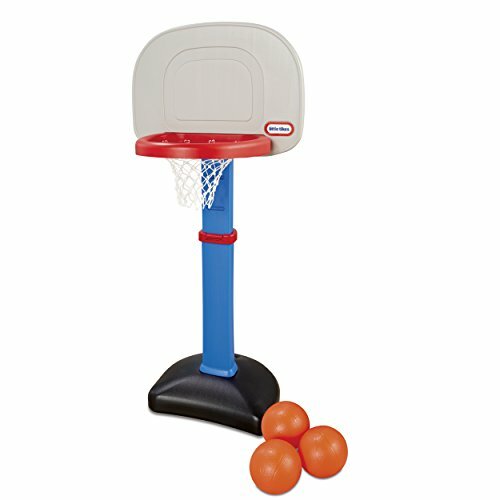 Boys and girls can have a ton of fun playing with this Basketball Set by Little Tikes. We liked how it can be used both indoors and outdoors. This allows kids to play with it indoors if the weather isn’t great. However, it also encourages them to play outside if the weather is great. Moreover, throwing the balls into the hoop is an exciting way for your little one to develop their motor skills and hand-eye coordination. You can also adjust the height of the hoop between 2.5 and 4 feet. Furthermore, the size of the rim has purposefully been made with a larger design to make sure that it isn’t too hard for younger kids to use. This is an awesome basketball set that boys and girls can have fun playing with both indoors and outdoors. Their motor skills and coordination are able to develop well. 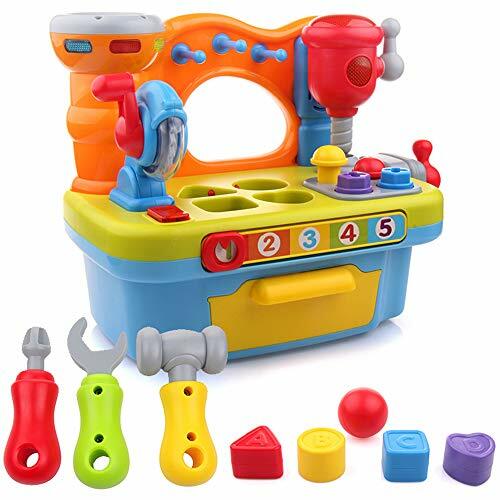 With a range of 7 different toy tools available, you can be sure that your little boy will be able to keep himself busy with this work bench for hours on end. The tools include a toy hammer, wrench, screwdriver, chainsaw, bench clamp, and a drill. Kids have a blast using these tools to pretend to make things and use their creative thinking skills. In addition to this, there are 7 songs included, as well as sound effects that makes the playing experience more exciting. They’ve also implemented flashing LED lights to make playtime even more fun. Children are also able to play with the shape matching games that are available. This is great for their matching skills, as well as their color and shape recognition. The 7 different tools, light, and sound effects available with this set are effective at keeping your little boy entertained for a long time. They’re able to improve their color and shape recognition skills too! This Activity Cube has a 6-in-1 design that provides boys and girls with plenty of things to play with for hours on end. It includes a range of sorting activities, as well as alphabet and music learning features. As a result, this activity cube is incredibly educational. It helps children to improve their matching and sorting skills, while also developing their knowledge on different letters while having fun. We liked how there are music features built-in to the cube as well. These make it super fun to play with and stimulate your little one’s auditory learning skills. Parents have been glad to find that the materials used to construct this one are free from toxins. Due to how interactive this activity cube is, kids feel more encouraged to learn about the alphabet and have fun improving their matching and sorting abilities. 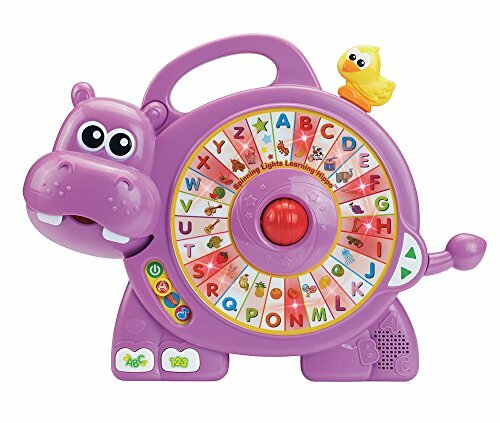 VTech’s Learning Hippo is another highly interactive option in our review that boys and girls have been loving. It’s awesome for helping your little one to learn about numbers and letters. Children have a blast with how they can roll the ball and listen to how it makes sound effects. This is one of the fun interactive features that also improves your child’s audible learning senses. We also liked how this one is filled with 26 facts, as well as 4 songs, and 6 activities to play with. This ensures that kids are able to keep themselves occupied for a long time, while having fun. We liked how this Learning Hippo is super interactive as it helps kid to want to learn more about the alphabet from an early age. If you have a child who loves to be artistic, this Doodle Mat could be an amazing gift that they’d love. Boys and girls are able to draw on this mat in groups of up to 4 people at a time. Therefore, it can be a fantastic opportunity for your little one to improve their social skills and ability to work in teams. You could also use it as a chance to get involved in art projects with your kids to spend quality time together. Kids have a ton of fun being able to let their imaginative side run wild with this mat. As a result, it inspires them to use their creative thinking skills more than ever. It can also be a great way for your kids to strengthen their writing abilities. 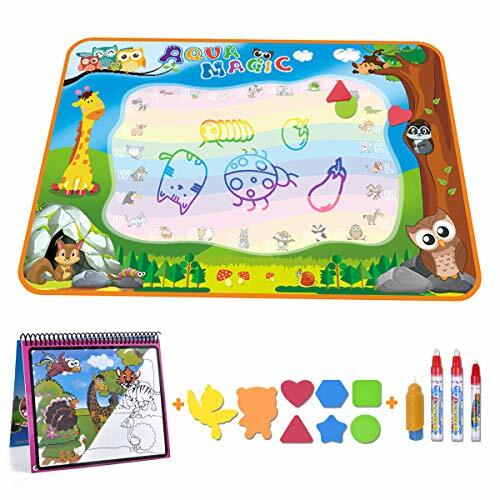 With a doodle mat as large as this, you can be sure that your kids will be able to let their creative side flourish and have fun in small groups. 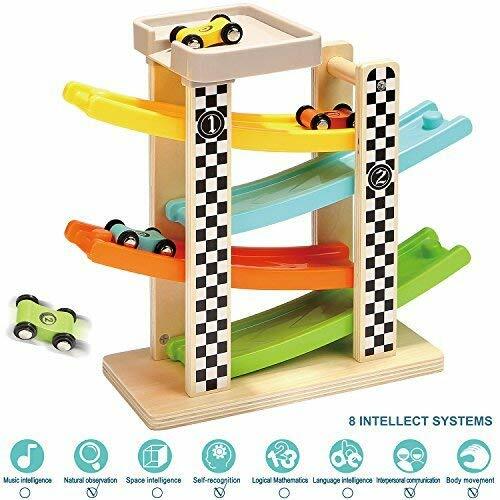 Top Bright’s Race Track Set is one of the best toys for 18 month old boys who love to play with toy cars. It features 4 ramps that are available in different and bright colors which makes it more fun for kids to play with. It can also improve your little one’s color recognition abilities. We liked how children are able to watch how their toy cars zoom down the ramps as it can be super exciting. The wooden materials that have been used are of a high-quality too. Therefore, you can be sure that it will last your child for years. 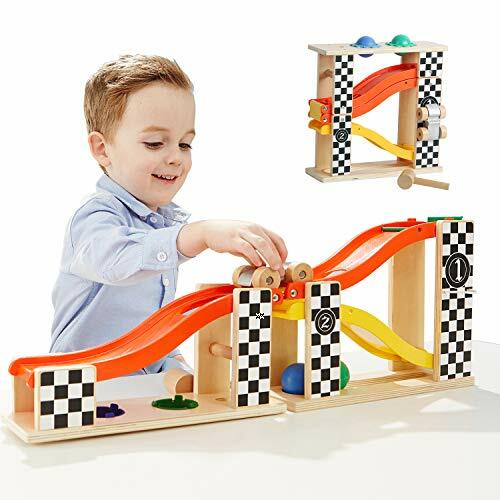 Boys have a blast with this set because of how exciting it is to see the toy cars race on the colorful ramps. 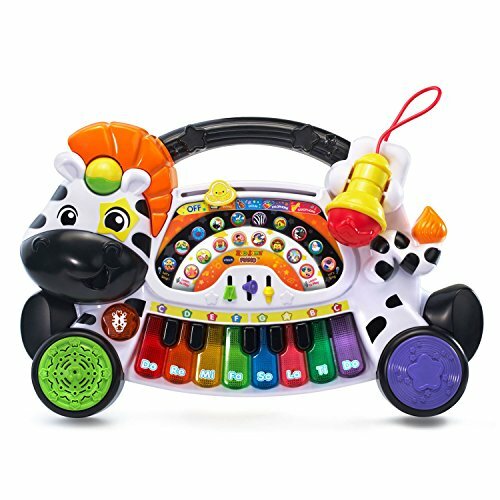 By pressing a single button on this toy, children are able to listen to a range of 8 different nursery rhymes. In addition to this, there are numerous animal sound effects available as well. 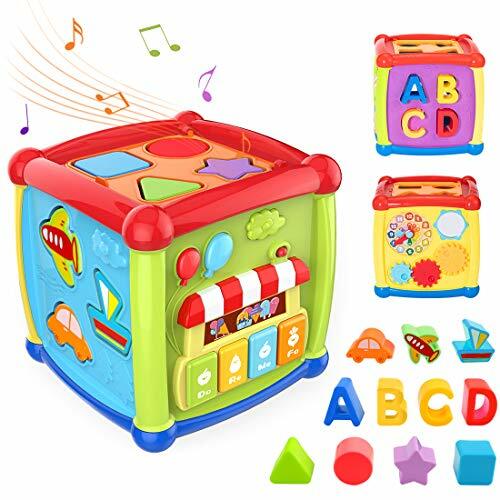 These music and sound features are incredibly exciting for boys and girls and improve your child’s auditory learning senses. 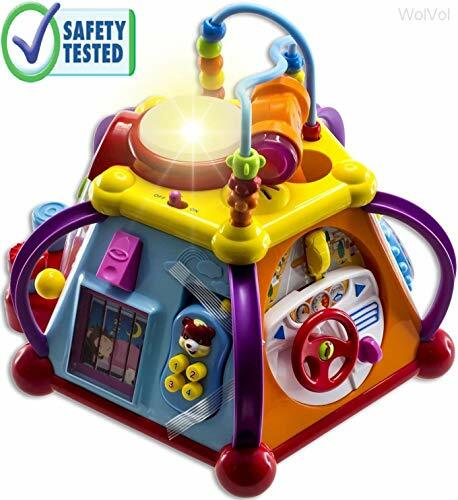 There are also flashing lights available which make the toy more interactive and improve children’s visual learning skills. 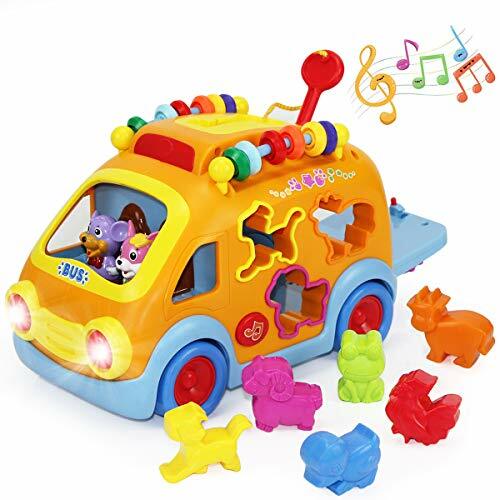 While kids are pressing the various buttons and playing with the animal toys that come with this set, their motor skills and hand-eye coordination are able to develop well. Not to mention, their creative side is able to flourish too. This is a fun toy that enables boys and girls to play creatively while improving their visual and audible learning skills. VTech’s Zoo Jamz Piano has a 4-in-1 design that allows kids to play 4 different instruments. These include the saxophone, violin, xylophone, and piano. So, your son or daughter has plenty to keep themselves occupied for a while. This is especially the case when you consider that there are more than 20 melodies and songs available to listen to. As a result, your kids are able to improve their audible learning senses. They can also use the melodies and songs as inspiration to come up with their own songs. Therefore, their creative thinking skills and improve greatly. Using the instrument toy is also excellent for your little one’s motor skills and hand-eye coordination. We were impressed with how there are 4 instruments available for kids to experiment with and be super creative. Their motor skills and coordination are also able to develop well. This activity cube features a range of 15 activities that are available across the 6 different sides. Therefore, boys and girls are provided with plenty to play with and remain occupied for hours. Kids can turn the gears and press various buttons to listen to music. They can even sing into the microphone to make sound effects and songs of their own. Not only is this great for their auditory learning skills, it also sparks their creative side. In addition to this, the cube has a range of light effects that make it more interactive to play with. Since the activities involve such a hands-on approach, children are provided with a great chance to develop their hand-eye coordination and motor skills. With such a wide range of activities available, kids can keep themselves entertained for hours at a time, while improving their creative thinking skills. 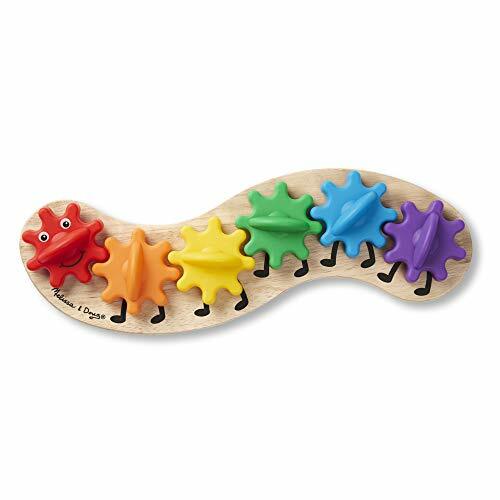 Melissa & Doug’s Rainbow Caterpillar Gear Toy allows kids to turn the gears and observe how it makes all of the different segments move. It’s an incredibly hands-on playing experience which is fun for boys and girls. This also means that your little one’s motor skills and hand-eye coordination are able to develop greatly. We liked how they have used a range of bright colors to design this toy as well. It’s more exciting for children to play with and can improve their color recognition abilities. The colorful design also inspires kids to use it with more imagination. As a result, your child’s creative thinking skills can improve. The colorful design and hands-on approach makes it incredibly exciting for kids. It’s awesome for their creative thinking abilities, as well as their coordination and motor skills. Boys and girls have been loving this activity cube. It comes with a range of instruments that include a bass drum, trumpet, jazz drum, and a guitar. Kids have a blast playing these instruments and developing their motor skills and hand-eye coordination. Playing these instruments is also fantastic for your child’s auditory learning senses. There are 5 sides available with this one which provides your little one with plenty to play with and stay occupied for hours. We also liked how the volume settings can be easily adjusted. This makes it great for different environments. Kids also have fun playing with this activity cube in small groups, which is great for your child’s social skills. With so many different activities available, kids can have a lot of fun using this cube toy to play in small groups with others and develop their social skills. This Jigsaw Puzzles set comes with 3 puzzles that boys and girls have been super excited to play with. We liked how it involves a hands-on approach to playing as it’s great for your child’s motor skills and hand-eye coordination. Furthermore, the puzzle aspect means that your little one can challenge themselves by trying to figure out how to solve them. As a result, their problem-solving abilities are able to improve. We also liked how they’ve designed the puzzles with bright and colorful aspects. This makes it more fun for children to play with and can improve their color recognition skills. The wooden materials used to make the set are of high-quality and free from toxins too. 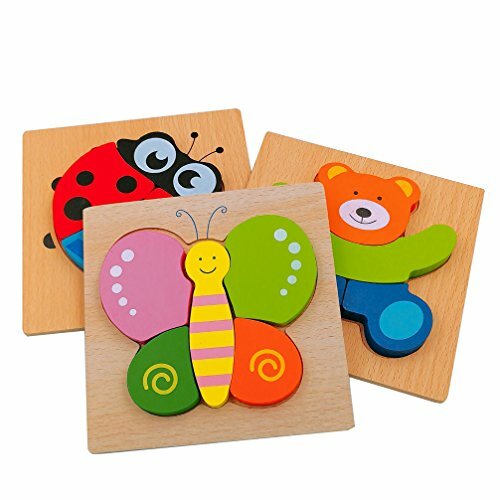 Children have a blast with trying to figure out these jigsaw puzzles and they’re able to improve their problem-solving abilities in the process. 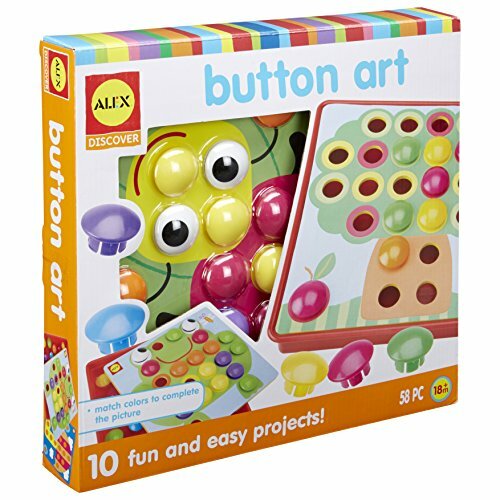 With a range of 10 pictures and 46 buttons available, boys and girls are provided with plenty to play with and keep themselves entertained for hours at a time. A storage tray is also available which makes storing the pieces away a breeze. We liked how the buttons are available in different colors too. This makes them more exciting for kids to play with and can be effective at stimulating their color recognition abilities. Your child’s motor skills and hand-eye coordination are provided with a great opportunity to develop as well. This is because the set involves a hands-on approach to playing. This is a fun and colorful set that kids love using to be creative with while developing their coordination and motor skills. The VATOS Baby Toy Car features 3 balls that are a perfect size for your son or daughter to hold onto and play with. They can drop the balls in the toy train and watch how it either comes out of the back door or spins around in inside. Kids can choose to move the toy train around or keep it still. It also has light effects and music that make it super exciting for children to play with. This is awesome for stimulating your child’s visual and auditory learning senses. We also liked how kids have an excellent opportunity to develop their hand-eye coordination and motor skills. This is because of the hands-on playing experience that’s available. Kids have a blast using the balls and toy train to play with this set for hours on end. Their motor skills and coordination are able to develop during the process. 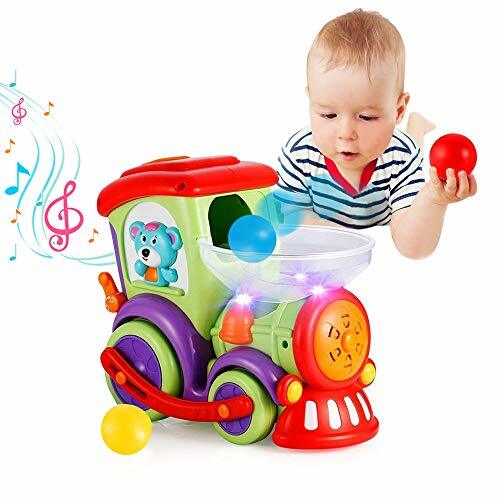 Now that you have a better idea of what some of the top toys for 18 month old boys and girls have to offer, you can begin to narrow down your search and pick the ones that you think are best for your child. If you’re not feeling 100% certain on which one to pick, don’t worry. We’ve put together this buyers guide section to provide you with additional information that can prove useful in finding the perfect gift for an 18 month toddler. While reading through our review, you will have seen that there are a number of different kinds of toys and gifts available. The section below lists out the different types so that you can easily distinguish between them all. We’ve included a number of fantastic activity cubes in this review because they are incredibly fun for little boys and girls to play with. These activity cubes come with so many different things for kids to play with that it keeps them engaged for hours. They encourage kids to play in small groups with others, which can be awesome for their social skills. Magnet building sets are excellent toys for 18 month old girls and boys. This is because they encourage your little one to develop their motor skills and hand-eye coordination. They’re also inspired to use the pieces to construct different things and be creative. Dolls and dollshouses are a classic kind of toy that 18 month old children love to play with. They are incredibly effective at encouraging children to use their creative thinking skills while playing. There are a few sports sets mentioned in this review and toddlers have been having a ton of fun with them. They’re excellent for improving your child’s motor skills and hand-eye coordination. They can also be used both indoors and outdoors, which provides children with different playing options. The RC car toy that has been reviewed in this post is an excellent option for beginners. This is because it comes with a simple remote that allows kids to get used to how it feels to control the car to move around. Ride-on toys are super exciting for kid to play with. They have a blast riding around on them for hours. Moreover, they’re excellent for helping your little one to develop their balance and coordination. 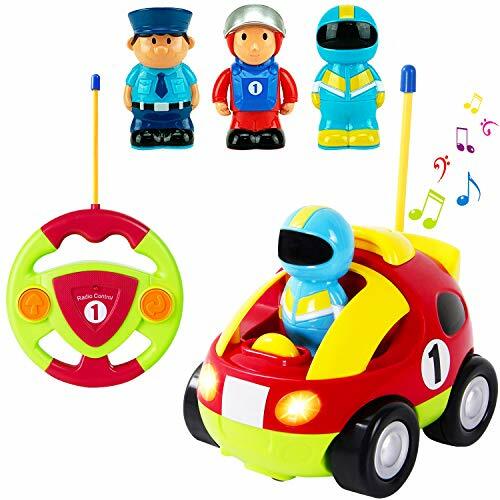 Instrument toys are super popular among toddlers including toy guitars, pianos, drums or anything else you could imagine because of how much fun they have with them. The ones mentioned in our review have multiple instruments available in one. This provides kids with more instruments to play and learn. Their auditory learning senses are able to develop incredibly well. Furthermore, your child’s motor skills and hand-eye coordination can improve greatly too. Puzzles are awesome for cognitively challenging toddlers. We’ve reviewed a jigsaw puzzle set in our review which children have been having a lot of fun with. Their problem-solving abilities are able to develop well. When it comes to finding gifts for 18 month old toddlers, it can be tricky searching for ones that are unique. If you have been struggling for unique ideas, you’ll want to check out this section. Art and craft sets are among the best unique gifts for toddlers. This is because children can use them to be as imaginative as they like, which can provide the gift with a more personal meaning. They’re also fantastic for improving a toddlers ability to think with more creativity. So, that brings our review of the best toys and gifts for 18 month old kids to an end. Be sure to read through the various options and consider the main features, pros, cons, and what makes each one stand out. That’s what will provide you with the best idea of which option to pick. You can also use our buyers guide section to gain even more useful information. We hope that all of the details in our review have helped to make picking the best gifts for 18 month old easier!